The inaugural PHL Unity Cup soccer tournament was billed as a way to celebrate diversity in Philadelphia. On Saturday, Nov. 5, 2016, teams from neighboring African nations Liberia and the Ivory Coast will play for Southwest Philly bragging rights in the tournament's final. On the western coast of Africa, Liberia and the Ivory Coast are separated by nothing but a line on a map. As it so happens, many immigrants from those two nations call Southwest Philadelphia home. That dynamic will be on full display Saturday as the inaugural PHL Unity Cup soccer tournament – after nearly two months of play amongst 32 teams – culminates on Saturday at Citizens Bank Park. “It’s very important symbolically," Mayor Jim Kenney said in June as the city announced the inspiration for the monthslong event. "We celebrate diversity, immigration and show our appreciation (for immigrants who) pay taxes, run businesses and employ people. We’re an international city and a diverse city that welcomes people and doesn’t shut them out." Liberia and the Ivory Coast will face off in a 6 p.m. championship match that follows a Unity Cup festival, youth game and parade of nations. 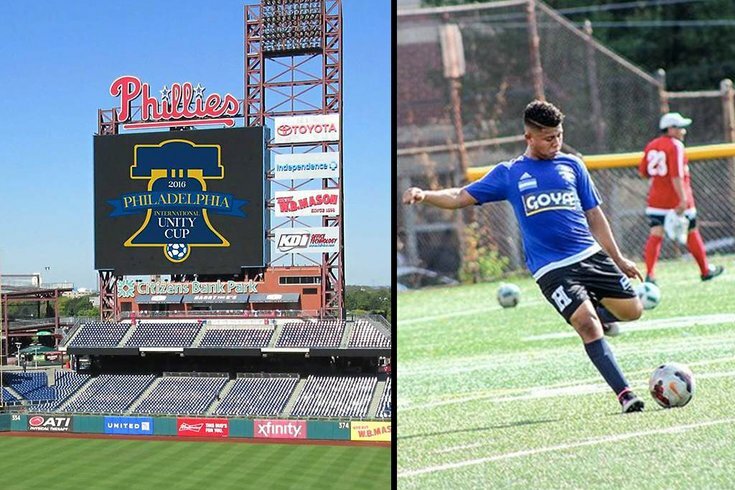 That youth game – featuring players between the ages of 12 and 14 – will technically be the first soccer match ever played at the ballpark that's been the Phillies home since 2004, but the Unity Cup final is the sporting day's highlight event. The Unity Cup was framed as a celebration of diversity, one that came amid a rhetorically nasty presidential campaign season that featured immigration as a hot-button issue. Now, it's become a "World Cup but a mini, mini version" event that other cities want to replicate, according to City Rep. Sheila Hess. "It's really been an educational experience. When Mayor Kenney (first broached this idea), we just assumed it'd been done before, but we asked ourselves what can bring all these people together. It ended up being a soccer ball," she said. "I'm a lifelong Philadelphian, but I had no idea we had so many countries represented here. "The love of everything about Philadelphia, they all have that commonality. It's just been a breath of fresh air to see everybody come together." Bill Salvatore, a Parks & Recreation Department manager, led the city’s involvement in an inaugural tournament that saw games played in conditions ranging from scorching heat to hurricane remnants. 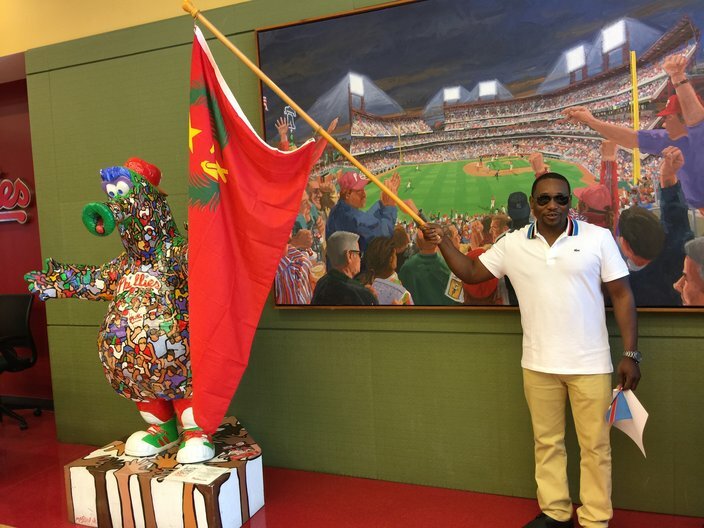 Ben Tarr, an immigrant from Congo, holds a flag from his homeland after the PHL International Unity Cup draw. His team will compete in a group that includes Indonesia, Lithuania and Argentina in the soccer tournament, which starts Sept. 10 and culminates with the first-ever soccer match at Citizens Bank Park on Nov. 5. He saw enthusiastic fans, cultural strangers becoming fast friends and a whole array of skill sets taking to the pitch. From the outset, observers deemed Liberia and the United States the favorites. While they were right about the former, the latter got knocked out in the quarterfinals by a Ukraine side that smothered them with defensive play and advanced on penalty kicks. When it comes to the diversity mission, Salvatore recalled a PhillyCAM taping involving the Mayor’s Office of Immigrant Affairs and team representatives at the tournament’s outset. That dynamic applied to Salvatore personally, as well, considering that the Nigerian team captain was a fellow city employee whom he’d never before met. Granted, those aren’t blanket sentiments. As Salvatore noted, it’s not as if all 32 teams became old-school pals, but some were over-the-top with it. The Liberia and Ivory Coast team practices were canceled Thursday night due to field conditions in Southwest Philadelphia, but PhillyVoice caught up with participants on the phone. Neewilli Saie, an assistant with the Ivory Coast team, couldn't be more grateful that the city put together this tournament. "We were so happy when we heard about it. It was very easy to convince the team to play," he said. "It gave us an opportunity to meet players from other countries. Though we knew many of them from club play, it was interesting to see everybody in a different setting." As for Saturday's final, Saie noted that there's a rivalry feeling involved, though not solely because of the neighboring African nations they represent. "Since we're both based in Southwest Philly, the guys run into each other all the time," he said. "There's been a little bit of trash talk in person, on Facebook. It's going to be a great atmosphere on Saturday. We're expecting the entire Southwest Philly there to root Ivory Coast onto victory!"